It is said that the only two things in life that are certain are death and taxes and that seems to be the case. Everything in the world around us is constantly changing. We have to let go of traditions, adapt to social, political and financial changes in the world in order to continue to function and fit into the world around us. All these changes, which seem to be happening both more rapidly and more dramatically today, have led to the possibility of seeing life and death from a new perspective. This perception is not really new; it is more of a remembrance of a natural way to see the circle of life and our role in it. If you stopped to consider the factors that had to come into play for life to exist on Earth, you would be astounded. The planet needed to be just the right distance from the sun with the right combination of materials to support life. This life also had to be maintained on this rocky ball, all while we continued to move through space at speeds we can only try to understand. Mother Nature has a pattern for all life. The start of the cycle is birth, followed by growth, reproduction and eventually death. However, death is not the end as the remains of the animal, plant, insect or living organism are used to nourish and provide for other organisms in the cycle. Without this cycle, sustainable life on the Earth’s surface would be impossible. Think about a tree and how it completes its cycle of life. A seed falls into soil, takes root and grows. Over the years it sheds leaves which are decomposed to enrich the soil in which the tree and other plants grow. Even when the tree falls over, in death the trunk and limbs are used in nature’s grand plan. In the oceans fish hatch, grow and eat, reproduce and die, with their bodies sinking to the bottom to feed other species of fish and organisms. These organisms and smaller fish then feed larger fish, continuing a never ending cycle. Each life form experiences the same type of circular process, each one nourishing and providing for the next. Animals, plants and organisms in nature have no time to worry about death. This is because they are too busy living each day. It is only the human species that worries, stresses and fears death. Researchers have actually discovered that prey animals, when trapped by a predator, fight for a short while and then give in, accepting their fate without distress or increased struggle. It is as if they understand the role that they are to play in the grand scheme of life. Also see: Why Do We Choose To Be Born? 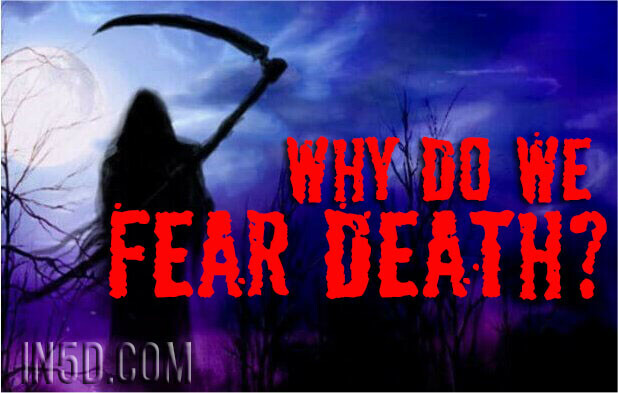 Perhaps the reason that humans, particularly in western cultures, now feel a fear of death is because we no longer see ourselves as part of this natural cycle. There is no sense of amazement at the wonder of life and our place within the universe. Our focus is on what we can prove, what theory is most in fashion and how important and essential we are in the world. There are still some cultures in the world that are very much connected to the land and embrace the thought of death as just another part of the cycle. These cultures not only accept death as a natural occurrence in life but they also show a respect and appreciation for their ancestors and those that have gone on before. The wisdom of the culture is passed down from generation to generation, instead of being forgotten as being no longer relevant. They seek understanding in the past, and revere those that have gone before. If you stop to consider death you will find that sometimes, even though it is an ending, it is also a new beginning. The death of a relationship allows you to seek new people in your life that can be stronger, more supportive and better for you. As we make choices based on our life experiences, old perceptions die and wilt while new understanding flourishes. This is also repeated on a worldwide scale. Cultures and civilizations die to be replaced by more advanced groups. Catastrophic events such as meteor strikes may wipe out most of the life on the planet yet other species better adapted to survival rises up from the ashes. New ideas and philosophies replace those that may have been seen as the only way in times gone by. Instead of dreading death it is important to see death as a natural part of life. By giving up your fear of death you can enjoy the life you are experiencing today. All that time you spend worrying about how death will occur is time you simply do not have to live the life you have been given. We will all die and none of us know when it will happen. Some will live long lives while others may have short lives, but everyone can make their life count. When people spend all their time worrying about things that have yet to occur they are engaging in a process known as projection. Projection is common in people that fear death and they typically do not realize how their worrying is decreasing the quality of life they are experiencing. Letting go of projection and living life to the full really is the best possible option. Getting your affairs in order and planning for your death is one way to help stop projection since you can rest assured that things will be handled properly. We do not understand what happens in death or why death occurs when it does. It is difficult to see the big picture when a loved one passes away unexpectedly or at a young age. Instead of trying to rationalize and determine why a death occurred, it is best to consider that there is a much bigger picture in play than just one life. We all have a part to play in the drama of life, although we may not completely understand our role. Often the death of a loved one is part of our learning experience. We may learn how to grieve, how to let go, or even to become more in harmony with our spiritual being. For many cultures death is not seen as the end of a life, but the release of the spirit from the lessons learned while on earth. In these cultures death is often recognized as a part of the journey of life, resulting in life on the other side that is truly wonderful. Even for those that may not have the same view of death and the afterlife, spending time stressing and worrying about the inevitable robs you of the time you have here on Earth. Enjoying your life, making sure it is filled with laughter, love and fun is the best way to spend your days, not worrying about a part of your life over which you have no control. Caroline Nettle is passionate about healing, recovery, and assisting others to grow. Her website Spiritual Growth Tools is the culmination of many years of seeking answers about her own health and well-being, and studying the human condition. She writes articles, is a healer and gives talks about subjects relating to spiritual growth and personal development.